Part 5 in a series featuring sites I visited in Ireland while researching my second novel, The Prince of Glencurragh. See previous post links below. In The Prince of Glencurragh, the spectacular Lismore Castle in County Waterford is the setting for three emotionally-charged scenes. The grand drawing room and the ancient towers provide dramatic backdrops that help fortify the story. Taking its name from “lis” meaning fort and “mor” meaning great, the castle is situated on the right bank of the River Blackwater in County Waterford. One story has it that when King James II visited the castle, he backed away from the grand window overlooking the river, startled by the sheer drop to the riverbank when the entrance to the castle is on ground level. The window was ever-after called King James’s window. Sources differ as to the date of construction, but sometime between 1179 and 1185, Lismore was built on the site of the ancient abbey of Mochuda. The castle was later rebuilt as an Episcopal residence (one source says it belonged to the earls of Desmond), until in 1589 when the manor and lands were granted to Sir Walter Raleigh. Sir Walter fell from grace after the death of Queen Elizabeth, and sold the estate to Sir Richard Boyle, the first Earl of Cork. Raleigh was later executed by King James to appease the Spanish, who saw Raleigh as a plundering pirate. Lord Cork made extensive improvements to the castle for use as his primary residence. Outbuildings were added, and interiors embellished with fretwork plaster ceilings, tapestry hangings, embroidered silks and velvet. Some of the outbuildings were destroyed in the rebellion of 1641 when the castle was closely besieged by 5,000 Irish, and defended by Lord Broghill, the earl’s third son. The Cavendish family acquired the castle in 1753 when the daughter and heiress of the 4th Earl of Cork, Lady Charlotte Boyle, married William Cavendish, 4th Duke of Devonshire, who became Prime Minister of Great Britain & Ireland. The 9th Duke, Lord Charles Cavendish, married Adele Astaire, the sister and former dancing partner of Fred Astaire. Lismore is now an exclusive accommodation and event venue, and even offers culinary packages. The famous gardens are open to the pubic. The upper garden is a 17th-century walled garden, also briefly featured in my book. Thanks to C.L. Adams’s Castles of Ireland, LibraryIreland.com, celticcastles.com, lismorecastle.com. Read other posts in the series: Part 1, Part 2, Part 3, Part 4. 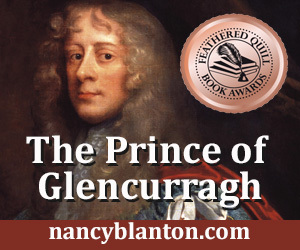 The Prince of Glencurragh has won the Royal Palm Literary Award for historical fiction. It is a story of 17th century Ireland, in a time of sweeping change prior to the great rebellion of 1641. Available in ebook, soft cover and hard cover from online booksellers.